Nonoperative treatment: 3 months of physical therapy focusing on strengthening the dynamic stabilizers. 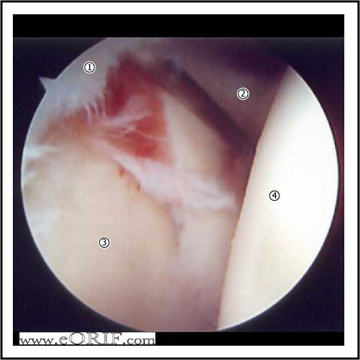 If non-op treatment fails to eliminat symptoms arthroscopic repair with suture anchors is indicated. Ensure adequate anchors are available including any instrumentation needed for their insertion. Generally 3.0mm or smaller bioabsorbable or metallic suture anchors are utilized. 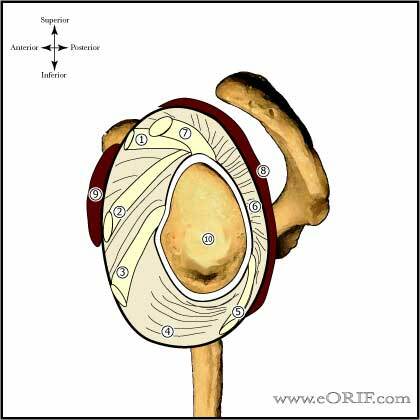 Perform Shoulder arthroscopy. Note that 73% of shoulders demonstrate some normal anatomic variant to the superior and/or anterior labrum that can be confused with a SLAP tear or anterior labral tear. Debride superior glenoid with shaver. Lightly decorticate the superior glenoid with an arthrscopic SLAP burr. Place anchors in superior glenoid. At least one suture anchor should be placed beneath biceps root with suture looping through posterior half of the biceps root, elimating peel back sign. Achors should be placed in @ 30° angle in relation to the articular surface for maximal bone support. (Lehtinen JT, AJSM 2003;31:257). Pass sutures. (Spectrum Suture passer or similar instrument). Tie arthroscopic knots with the labral side suture as the post. Posterolateral portal: consider for lesions involving posterosuperior labrum as it is nearly impossible to place an anchor in the round edge of the posterosuperior glenoid. This portal should be used without a cannula, just for drilling and anchor placement. Hardware failure / Anchor pull-out / Synovitis with biodegradable anchors. Post-Op: Place in sling. Active wrist, hand ROM. Pendelum shoulder exercises. Avoid any active elbow flexion/supination. Keep elbow flexed and humerus internally rotated to avoid tension on biceps. 10 days: Start PT, continue sling for 4 weeks. Avoid any active elbow flexion/supination. Avoid excessive external rotation, especially in abduction to limit shear forces on the repair. 6 weeks: Discontinue sling. Progressive strenghening program. >85% good to excellent results. (Field LD, AJSM 1993;21:783).